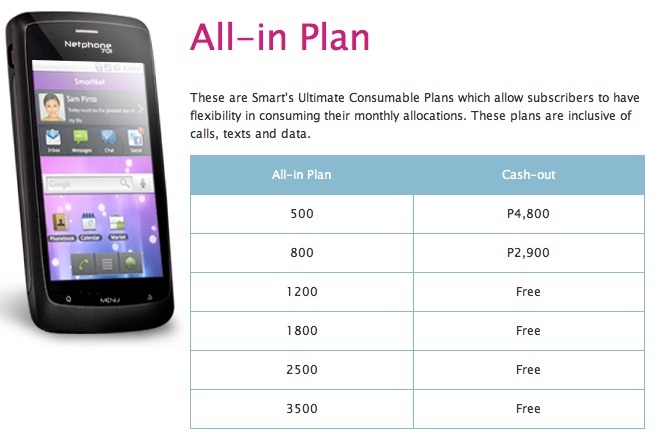 This is the list of plans on postpaid. And here is the list of daily and monthly “bite sized” plans for data. If you look closely, there is an obvious “sweet spot” in the pricing scheme under the “all-in” unlimited monthly data for PHP 999 a month as apart from unlimited IM and social stream usage (that’s SmartNet, Facebook and Twitter), you also get 3,500 SMS messages and 200 minutes of voice calls. Insane. I’d change my 8 year old plan if I could. If you’ve all been curious as to what exactly the Netphone can do, there’s a guided tour on the Netphone site. need to release 4,800 first to get the phone? or 500 only?